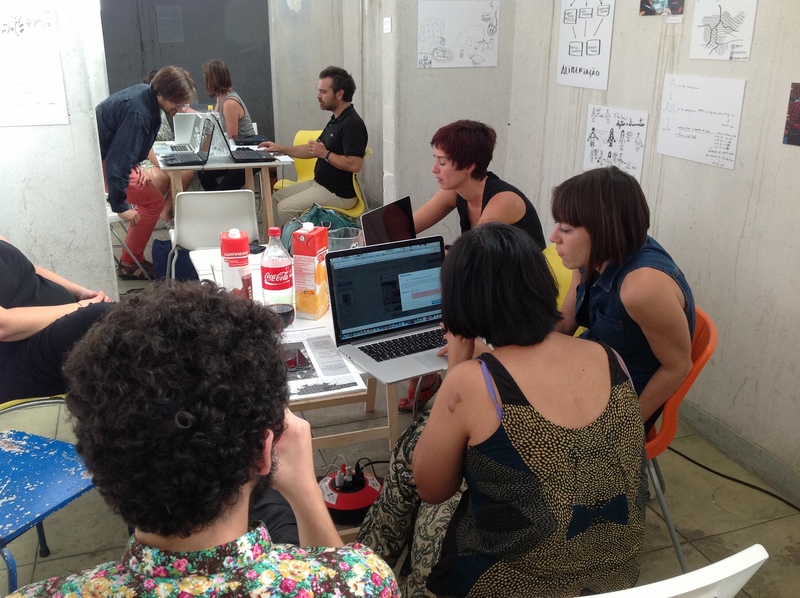 On Saturday September 21 Museu da Crise presented its Unofficial Education Department. In collaboration with UX/UI Designer Klasien van de Zandschulp (Zo Niet Dan Toch) we have digitally enhanced the official printed material, such as the posters, flyers and exhibition handouts, of the Lisbon Architecture Triennale 2013. A virtual layer has been added that you can uncover after downloading the Layar app on your smartphone and following the instructions. Also using Layar, you can discover the virtual augments we added to some public spaces within the city of Lisbon. Search for the Museu da Crise layar and walk around. The Unofficial Education Department will keep growing over the next few months, so hold on to those flyers and handouts! Within the context of the Unofficial Education Department, we also asked Klasien to give a workshop on interactive print and augmented reality. The results of this workshop are now presented as part of the Emerging Collection of the Museu in our space at LXFactory. Drop by and have a look! A 21 Setembro o Museu da Crise apresentou o seu Departamento de Educação Não Oficial. Em colaboração com UX / UI Designer Klasien van de Zandschulp (Zo Niet, Dan Toch!) aumentámos digitalmente o material oficial impresso, como cartazes, panfletos e folhetos das exposições, da Trienal de Arquitectura de Lisboa 2013. A camada virtual acrescentada, pode ser descoberta através do download do aplicativo Layar no seu smartphone. Descobre ainda com o mesmo aplicativo alguns objectos acrescentados no espaço público de Lisboa. O Departamento de Educação Não Oficial vai continuar a crescer nos próximos meses, por isso vai vendo o que continuamos a acrescentar aos panfletos da Trienal! No contexto deste Departamento, também foi dado pela Klasien van de Zandschulp um workshop sobre imperssão interactiva e realidade aumentada. Os resultados fazem agora parte da Colecção Emergente do Museu da Crise, presente no espaço da LX Factory. Aparece e dá uma olhadela!